[RUMOR] First of all, notice the rumor tag. Noticed? Okay good. 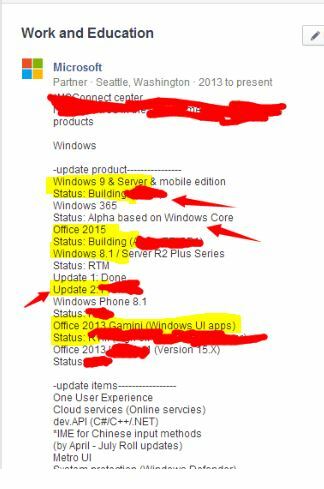 This particular leak comes from a known Microsoft leaker Faikee (via myce.com ) from a source we have not used before, so take it with a pinch of salt. What the leak basically states is a highly integrated (into the cloud) and unified Windows among the PC and Mobile platforms. The impacts of that on household usage and gaming are of course very significant, while the impact on the server market almost negligible. Alleged ‘Windows 365 ‘ Screenshot. One of Microsoft’s foremost motivation for moving towards an integrated OS is Gaming. More specifically the ultimate operating system, one that will carry forward your work/entertainment flow from one device to another. Microsoft wants a future where you can have a unified environment in your home to which all Windows devices are connected. Now we already knew Microsoft is working on Windows 9 but this leak, if true proves the existence of either of two things, one more likely than the other. Likely: A new Windows 365 ‘Windows as a Service Subscription Model’ or unlikely: Windows 9 havening subscription model features. I am only mentioning the later just in case because if this leak is correct than this is definitely a new Windows 365. Rather like the Office 365 which consisted of a paid subscription model too.